PORT COQUITLAM, BC – The first craft brewery in Port Coquitlam is now open in the city’s Fremont Village area. Northpaw Brew Co. has been founded by Courtney Brown, Warren Wagstaff, and Dennis Smit, and entered the market last year with contract brewed versions of several brands including Jamaican Pale Ale (5.2% abv, 30 IBU), C.R.E.A.M. Ale (5.6% abv, 20 IBU), None & Done ISA (4.9% abv, 35 IBU), and Solstice IPA (6.9% abv, 70 IBU). 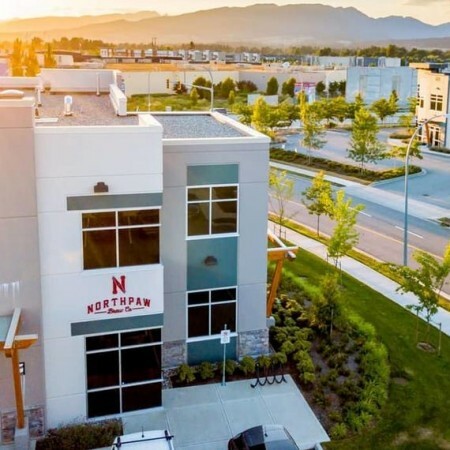 Located in a 3,700-square-foot space at 2150-570 Sherling Place, the Northpaw facility includes a tasting room serving glasses, pints, and growlers, along with a light food menu. Following today’s 12:00 noon opening, business hours will be 11:00 AM to 9:00 PM on Monday to Thursday, 11:00 AM to 10:00 PM on Friday and Saturday, and 11:00 AM to 8:00 PM on Sunday. For more details, see the Northpaw website and Facebook page.